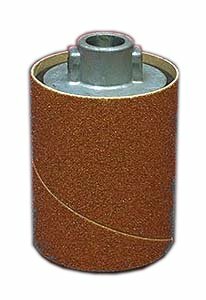 2-1/4" Shopsmith drum sander is 3" high with a rubber expansive drum that can be attached quickly to the spindle on your Mark 7 or Mark V, your Shopsmith Power Station... or the auxiliary spindle on your Shopsmith belt sander. Just slip the sleeve on, tighten the expansion bolt and go to work. Note: Should always be used with the Drum Sander Table Insert. 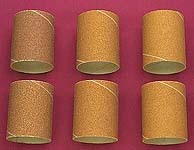 2-1/4" x 3" Sanding Sleeves (six sleeves per package). Available in Fine, Medium, Coarse and Assorted. Lets you use your Dust Collector to eliminate workshop dust.